And he made light of a big weight to win the Secretariat Stakes. Surcharge got rave reviews from his connections and punters alike after he justified 15-10 favouritism and won his biggest prize to date in Saturday’s R150,000 Supabets Secretariat Stakes (Listed) over 1400m. The excitement was not only because of his easy win, but because Surcharge is one of the bestlooking thoroughbreds around. The Stuart Pettigrew-trained three-year-old was backed from 28-10 in the morning and made light of the 60kg he was asked to carry. 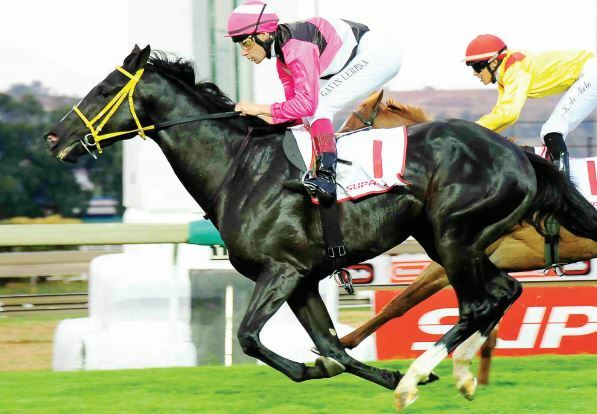 Lerena had him in mid division as Varimax led before giving way to Prince Of Kahal. King’s County was on the rail disputing third place with O Lucky Man. Polar Ice was just ahead of Harlan County on the rail and the favourite, about six lengths off the leader. Keanan’s Rock and Blackball were ahead of Full Of Attitude, Flying Winger, Dhabyaan and Decision Time. Varimax took over again shortly after they turned into the straight and 400m out Surcharge still had about three lengths to make up. He got tight for a gap, losing his stride slightly but bravely went through and burst into action, winding into full cry to lead about 300m out. Surcharge gave Lerena his second win of the day after best bet Lobo’s Legend delivered the goods in Race 3 for trainer Joe Soma. Lerena shared riding honours with JP van der Merwe (Colour Of Light, Race 1 and Il Modo, Race 7) and Callan Murray (Excalibur’s Return, Race 4 and Mable Syrup, Race 8). Both Murray’s winners are trained by Mike de Kock.